What is the Mangosteen and why is it called the "Queen of Fruits"? In Asia, the mangosteen is known as "The Queen of Fruits". 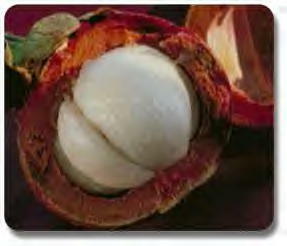 It’s scientific name is Garcinia Mangostana but it is more commonly called mangosteen. The mangosteen is about the size of a tangerine and has a smooth, dark purple rind called the pericarp that encases the delicious white fruit. It is considered the “Queen of Fruits” because not only is the mangosteen a fruit that actually tastes good, but it contains over 40 very powerful phytonutrients called Xanthones. Why haven't I heard of it before? You probably haven't heard much about the mangosteen before. Even though it is largely unknown in many parts of the world, the mangosteen has been used both as a food and as a medicine in Southeast Asia for many centuries. It has been transplanted into many other countries in Central and South America, India, Southern China and the Caribbean where it is also used as food and medicine. Healers from these areas have used the mangosteen in folk medicine treating diabetes, diarrhea, inflammation, eczema, urinary tract disorders, fever, and gastrointestinal problems - to name a few. Because of some of these claims, university scientists became curious about the mangosteen. Scientists wanted to know why the mangosteen was so effective. Subsequently, more than 50 scientific studies have been published and more studies are ongoing.